The University of Texas at Austin’s WeTeach_CS program trains K-12 educators to improve access to high quality CS experiences for a broad and diverse range of students. WeTeach_CS is increasing the number of CS certified high school teachers, increasing the number of high schools offering CS courses, increasing the number and diversity of students enrolled in CS courses, and expanding access to computational thinking, coding and programming experiences for all students in K-8. These outcomes are accomplished through both online and face-to-face professional development for K-12 teachers. 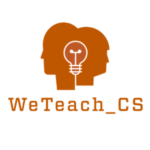 The initial focus of WeTeach_CS was Texas but with the publication of online resources, educators from across the world are now utilizing WeTeach_CS professional development materials to improve their practice and diversify their enrollment. Since 2015, Texas has seen a 124% increase in enrollment of females, a 154% increase in underrepresented minorities and a 156% increase in economically disadvantaged students enrolled in HS CS courses. The Strategies for Effective and Inclusive CS Teaching is a facilitator led online course designed to support cohorts of secondary teachers focused specifically on broadening participation in CS courses. Topics addressed include unconscious bias, stereotype threat, computing for social justice, and research-based strategies for recruiting and supporting diverse students in CS. The course is approximately 6 weeks long and course completers will earn 24 hours of CPE credit from UT Austin. The course will be offered at UT Austin in the fall of 2019. CISE PI’s could use this course to meet their K-12 BPC goals with teachers involved in their CISE projects. The course is hosted in Canvas through UT Austin but can be taken by non-UT Austin teacher participants. Details about the course and syllabus can be found at https://stemcenter.utexas.edu/strategies-effective-and-inclusive-cs-teaching. This course is ideally suited to a cohort of educators working together with a facilitator to improve its practice. Registering for the course ($149/teacher) will place you in a cohort with a University of Texas at Austin instructor serving as the facilitator. Groups interested in providing their own facilitator can access the course, virtual training for the facilitator, and the facilitator's guide for free for up to 30 teachers through December 31, 2019 thanks to support from Google. Contact carol.fletcher@utexas.edu to discuss this option or how to include this course in your CISE proposal beyond 12/31/19. Yes. Google funding will cover course costs for up to 30 teachers through 12/31/19 if external organizations can provide their own facilitator.